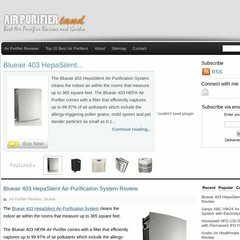 Topics: Air Purifier Reviews, Reviews And Tips, Disclosure, Airfree, and Alen. The site has about 44 users daily, viewing on average 3.00 pages each. The site is programmed for W3 Total Cache/0.9.1.3. Its 2 nameservers are ns2.hostmonster.com, and ns1.hostmonster.com. It is hosted by Bluehost Inc (Utah, Provo,) using Apache web server.